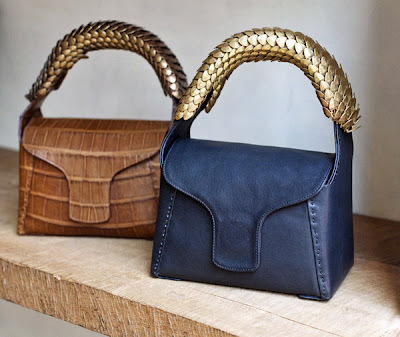 Bonjour Singapore: Fashion blog with a focus on Asia: Bonjour Beirut: Johnny Farah's fabulous bags! This is a man who found different inspirations from Danish functional architecture and started a leather range, opened the uber stylish IF boutiques in Beirut, NY and recently Dubai, bought an organic farm and opened two restaurants where he still frequently cooks. He is the definition of the chameleon businessman. I stumbled over Johnny Farah’s concept leather store in Saifi Village, one of the coolest shopping destinations in Beirut. The smell of leather pulled me in Inside, where I was confronted by beautifully arranged bags, belts, shoes and some accessories which looked perfectly-made and a tad too purist for the average Lebanese person’s wild taste. Among the range are beautifully-crafted and mostly hand-made products which are chic and functional and look like they would last a couple of decades. The quality of leather is some of the best I’ve seen anywhere! Walking through the shop, it's like a crash course on different kinds of leathers and the variety of techniques used on each piece to make it as perfect as possible. From the ordinary but soft and buttery lamb and goat leather to more exotic skins like alligator, ostrich, lizard and others. The man knows his leather and most importantly designs to complement and show off the natural beauty of each kind. But one thing caught my eye instantly - and that was the gorgeous bag which is part of Johnny’s collaboration with Lebanese artist and sculptor Ranya Sarakbi capsule collection. It features a stunning metal handle that was made from smaller pieces to mimic a snake’s look and movement. The result is an arm candy to die for, so classic yet creative that it might as well be displayed as a piece of art somewhere! Being the magpie that I am, I was also stopped by some colourful patent leather flats which as the store manager explained are hand-dyed in layers to create an almost custom effect that makes each piece unique. Basic, well-made and beautifully-crafted bags with exceptional quality leather and finishing is surprisingly hard to find these days when giant logos, monograms and distracting hardware are over-shadowing the quality of the leather. It’s so refreshing to see someone going back to basics, functionality and creating some aesthetically superior pieces with no fuss. Best thing is – this designer is a Lebanese veteran whose taken the best minimalist aesthetics from Copenhagen and NY and poured it back into locally-crafted chic products which are a world’s away from the Guccis and LVs flooding the fashion world. Johnny Farah's leather bags and accessories are available at various stockists around the world and online. Check out their website for more information.